If you want to take your fly fishing game to the next level, you couldn’t pick a better place than Costa Rica. Fly fishing Costa Rica’s coastline will get you on huge Snook, brutish Roosterfish, and an army of Jacks. 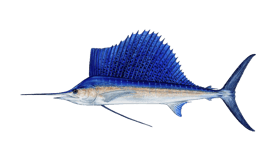 Head offshore, and you can try for many anglers’ life ambition – taking Marlin and Sailfish on the fly. And that’s just the Pacific Coast. Head inland or over to the Caribbean, and you will find incredible Tarpon fishing. The whole country is teeming with gamefish just waiting for a tasty-looking fly to float their way. 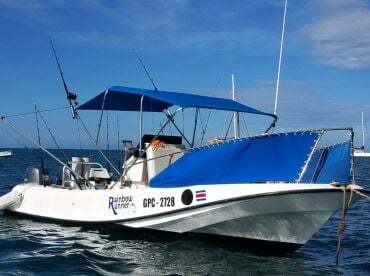 Costa Rica is so blessed with sportfish that you can find great hookups pretty much anywhere. There are a few iconic areas you have to hit to really get the most out of the country. Here are some of our favorites. All along the Pacific Coast, hundreds of streams and rivers dump nutrients into the sea. This is a perfect hunting ground for world-record Snook. We’re not exaggerating here, just ask the IGFA. 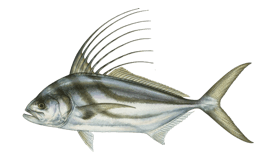 Search the sandy bottom nearby, and you can also find Costa Rica’s signature inshore species - Roosterfish. These punkish predators are every bit as aggressive as they look. Pound for pound, they’re as tough to bring in as any other fish in the country. You can fish any river mouth for these guys. Central and southern Costa Rica have produced the biggest fish in recent years. Jaco, Quepos, and Golfito are all great spots to start. Fancy landing something a little bigger? Is bringing in Roosterfish just not hard enough? 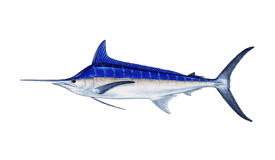 How about Sailfish, Mahi Mahi, and Marlin? Head offshore. and that’s exactly what you’ll find. Fish Aggregating Devices (or FADs, for short) can be anything from buoys to broken branches. Small fish shelter near them, bringing Marlin and other apex predators right up to the surface. This, plus the famous aggression of Pacific Sailfish, makes Costa Rica one of the best places on the planet for taking Billfish on the fly. 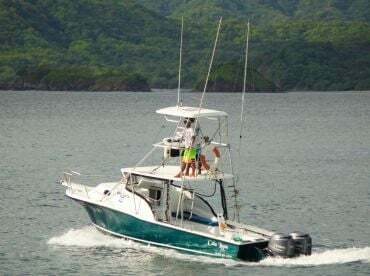 You can fish anywhere from Playa Flamingo and Tamarindo in the North, to Golfito and Puerto Jiménez in the South. The biggest fleets are in Quepos and Jaco, though. You can find more big game fly fishing specialists here. Costa Rica’s Caribbean Coast is much less explored than the Pacific, but tales are told of monster Tarpon. They don’t just live along the coastline, but deep in the jungle in freshwater lagoons. Tarpon need no introduction among lovers of the fly game. Everyone wants the chance to bow to the Silver King, and where better than the palace of fly fishing that is Costa Rica? When stalking the shallows, weight-forward floating line lets you place your flies from afar and avoid spooking the fish. Snook are suspicious by nature, and Roosterfish are erratic at best, changing direction on a dime. Keeping your distance is the key to calm fish. Most fly fishing guides use custom flies to suit the area, with 12-weight rod and matching reels. If you’re after Roosterfish, you’d better bring a lot of backing. When fishing the FADs, the go-to tactic is bait-and-switch. This involves trolling unhooked teasers, then switching in your fly line just as the fish comes close. You can theoretically land Marlin on a 12-weight, but bulking up makes life a lot easier. Tube flies are a great choice. 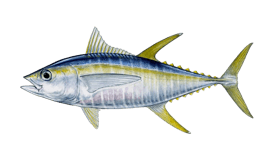 They’re hardier than most, and suit the triple-hook setups which work best for Billfish. Whatever you use, bring long, monofilament leaders and proper saltwater reels. This isn’t the time to economize on your gear! We could talk all day about fly fishing in Costa Rica. The fish, the boats, the waters themselves – everything is set up for world-class fly action. You really have to live it to believe it. So next time you’re planning a vacation, cast an eye down to Central America. You won’t regret it.